Getting the entire family involved. 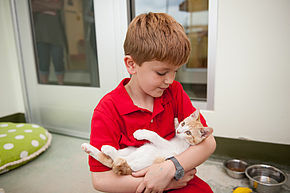 PAWS Chicago's Youth Volunteer Program enables children ages 12 to 17 to volunteer with a parent or legal guardian to help homeless pets together. Become a Family Service Volunteer - get started by filling out this application. As part of the Family Service Adoption Center Preparation Team, you will help PAWS Chicago maintain a clean and safe environment for our homeless animals. Weekends, 8 a.m. to 11 a.m. The weekends are certainly a fun time at the Adoption Center. With so many guests visiting the shelter throughout each day, PAWS Chicago greatly benefits from the help of our Family Service Greeters. As a greeters, you will assist guests when they first enter the Adoption Center by answering questions and directing them through the Adoption Center. Weekends, 11 a.m. to 3 p.m.
As part of the Medical Center team, you will help PAWS Chicago maintain a clean and safe environment for our homeless animals. Questions about Junior & Family Opportunities? Have a question about volunteering?